Today, Matt welcomes Stache Novak, a burlesque dancer, host and everyman hailing from parts unknown but currently living in NYC. 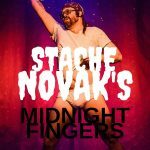 Having met Stache through his cousin (the delightful Matthew Holtzclaw) Matt and Stache discuss his love of dance and how his show at The Slipper Room in NYC—Stache Novak’s Midnight Fingers—came to be. Stache lays it bare as they discuss his questionable choices and carefree lifestyle. They also get into his sensitive side and go deep into his upbringing, which has heavily informed his artistic drive in life. And so, from Stache’s origins in burlesque to the music that inspires him, here’s presenting Matt Storm and Stache Novak.